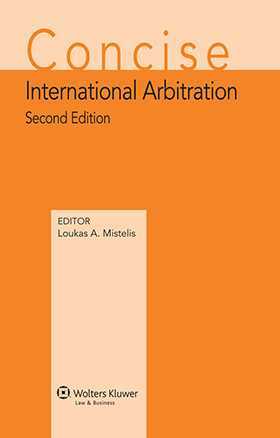 In an increasingly competitive market for information on international arbitration, the updated and expanded second edition of Concise International Arbitration stands out as a short, direct guide of manageable size that focuses on answering the essential questions that inevitably arise. The reality of international arbitration practice is that practitioners often work in an array of jurisdictions, under differing rules and different conventions. Therefore, rather than focusing on the rules of a particular institution, a particular country, or a particular convention, the article-by-article commentary in Concise International Arbitration offers the reader a swift understanding of all provisions of the leading arbitration instruments. Concise International Arbitration is part of Kluwer Law International’s ‘Concise’ series. These publications have proven enormously valuable to busy practitioners who require a succinct, accessible and authoritative commentary on the most commonly-used instruments, unencumbered by dense legal argument. Each book in the series breaks down the relevant texts by article and by each paragraph of the article, followed by one or more notes. The intention is to give the reader a rapid appreciation of the meaning and effect of each provision and to point in the right direction should further information (e.g., case law) be needed. As a reliable, quick-reference tool in situations where the reader is not closely familiar with, or needs to be reminded of the effect of a particular legal provision and how it relates to other provisions, Concise International Arbitration is unmatched. It will be greatly appreciated by courts, arbitrators, counsel to arbitration, attorneys, in-house lawyers, arbitration institutions, and academics. Convention on the Recognition and Enforcement of Foreign Arbitral Awards (New York Convention), 1958. Convention of the Settlement of Investment Disputes between States and Nationals of Other States (Washington/ICSID Convention), 1965. United Nations Commission on International Trade Law (UNCITRAL) Arbitration Rules, 2010.
International Centre for Settlement of Investment Disputes (ICSID) Rules of Procedure for Arbitration Proceedings (Arbitration Rules), 2006.
International Chamber of Commerce (ICC) Rules of Arbitration, 2012. London Court of International Arbitration (LCIA) Arbitration Rules, 2014. American Arbitration Association (AAA) International Centre for Dispute Resolution (ICDR) International Arbitration Rules, 2014. China International Economic and Trade Arbitration Commission (CIETAC) Arbitration Rules, 2015. Arbitration Rules of the Arbitration Institute of the Stockholm Chamber of Commerce. Singapore International Arbitration Centre (SIAC) Arbitration Rules, 2013. United Nations Commission On International Trade Law (UNCITRAL) Model Law On International Commercial Arbitration, 1985/2006. Arbitration Law of the People’s Republic of China, 1994. English Arbitration Act 1996 (Chapter 23), 1996 – Arbitration Law in England, Wales and Northern Ireland. French Code of Civil Procedure (Book IV: Arbitration), 2011. Swiss Private International Law Act (Chapter 12: International Arbitration), 1989.